Island Princess Gift Sets are the best value for the price as they are packed in a carton without gift wrapping. 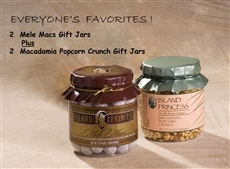 The sets are simply our quality Hawaii favorites such as Chocolates, Macadamia Nuts, Mele Macs, and Caramel Popcorn. Whether given as a gift, or to stock your own pantry, these gourmet sets are perfect!